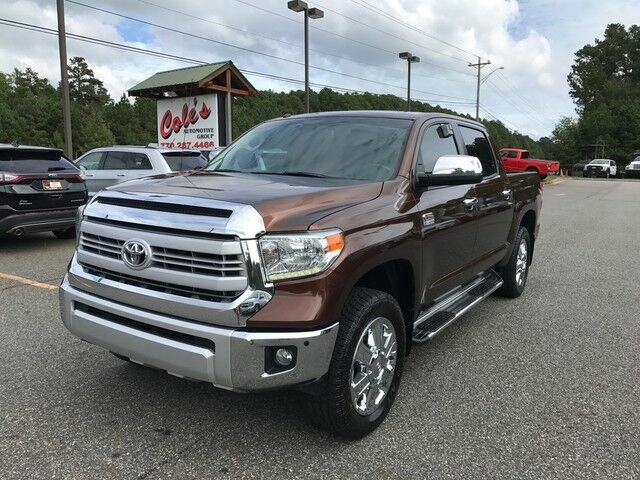 Check out this gently-used 2014 Toyota Tundra 4WD Truck we recently got in. This Toyota includes: FEDERAL EMISSIONS FFV SUNSET BRONZE MICA BEDLINER W/DECK RAIL SYSTEM BEDLINER W/DECK RAIL SYSTEM (PPO) Bed Liner WHEELS: 20" Tires - Front Performance Aluminum Wheels Wheel Covers Tires - Rear Performance WHEELS: 20" BLIND SPOT MONITOR LANE CHANGE ASSIST CARPET & ALL WEATHER FLOOR MATS Floor Mats BRUSHED STAINLESS STEEL STEPBOARD (PPO) 5" BLACK/BROWN, LEATHER SEAT TRIM 1794 GRADE PACKAGE WHEELS: 20" Tires - Front Performance Aluminum Wheels Wheel Covers Tires - Rear Performance *Note - For third party subscriptions or services, please contact the dealer for more information. * Drive home in your new pre-owned vehicle with the knowledge you're fully backed by the CARFAX Buyback Guarantee. You deserve a vehicle designed for higher expectations. This Toyota Tundra 4WD Truck delivers with a luxurious, well-appointed interior and world-class engineering. Do you encounter heavy snow, rain or mud when driving? No problem. With this vehicle, you've got the power of 4WD to help you overcome the toughest terrain. Intricately stitched leather and ergonomic design seats are among the details in which test drivers say that Toyota Tundra 4WD Truck is in a league of its own High performance is what this vehicle is all about. You will be reminded of that every time you drive it. This Toyota Tundra 4WD Truck 1794 is in great condition both inside and out. No abnormal "wear and tear". This Toyota Tundra 4WD Truck comes equipped with hard-to-find custom wheels. BRUSHED STAINLESS STEEL STEPBOARD (PPO) 5"